Fanuc M-40 AC spindle drive. Fitted with A20B-1000-0700 control pcb. A06B-6044-H140 Fanuc AC spindle servo unit M-40. A06B-6044-H0140 is in stock NOW. 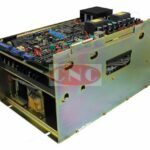 Both Fanuc analog exchange and test / repair services are available on the A06B-6044-H130 Fanuc AC analogue spindle servo unit. The drive is normally fitted with a Model 40 AC Fanuc motor and is a very large sized spindle drive. If required full testing of the A06B-6044-H140 or repair services which are also available if need be. CNC offer all work in house and do not outsource any repairs to AC analog spindles or testing outside of CNC. The Price for A06B-6044-H140 drive unit is second to none, for either service exchange with a core credit exchange policy, used outright surplus with an extended warranty, repair of the complete drive including the control boards A20B-1000-0700. And full comprehensive testing.testing. All A06B-6044-H140 AC spindle units are tested on Fanuc analogue controls and Fanuc AC spindle motor.